This is a record of our first trip to climb Mt. Olympus, Greece’s iconic mountain. We’ll endevour to include as much detail as possible from our 9 months of research prior to the trip and details of the trip itself. If at the end of this blog you have any unanswered questions, please feel free to contact us. The Summit of Skala 2866m in the mist!! 1:25 000 published by Anavasi. We bought it online from Stanfords in London. It’s a plastic rip proof map though by the end of the trip some of the printing was peeling off the base. However due to the poor visibility we encountered it got a lot of use. 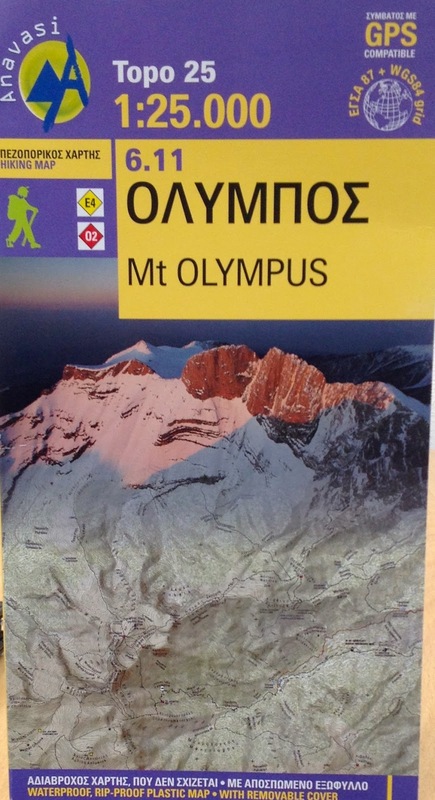 Mt Olympus has three peaks: Skala 2866m, Skolio 2905m and Mitikas 2918m. 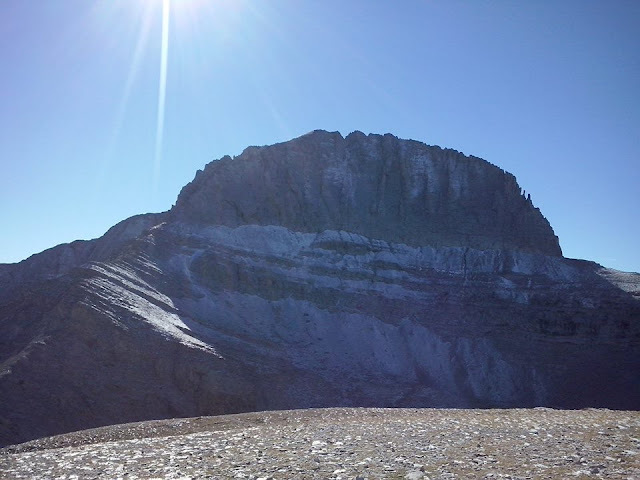 Both Skala and Skolio are accessable to walkers, Mitikas involves some easy but very exposed rock scrambling. The usual starting point for a trip to climb Mt. Olympus is the small town of Litochoro. From here depending oun your route it is normal to drive or take a taxi to one of the high starting points. We found a delightful guesthouse, The Palio Litohoro whose owner used to guide on Mt. Olympus. We stayed in Litochoro for the first and last night of the trip. The guesthouse looked after our travel bags whilst we were on the mountain. The guesthouse also arranged a taxi to take us up to our starting point; around 30 Euro's each way. 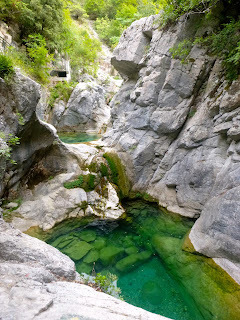 Eating out in Litochorro is easy, there are plenty of restaurants listed on Trip Advisor. We found Meze Meze on the first night, it was so good that we ate there again on our last night. Most people start their ascent from the road head at Prionia and ascend to “Hut A” for a night before making their ascent of Skala and possibly Mitikas before returning to Hut A for a second night. The descent to Prionia (where you can phone for a taxi) or a further 5 hour walk back to Litochoro via the spectacular Enipeas Gorge. We had decided against an “in and out” trip favouring a journey through the mountain. Our plan was to traverse the mountain and if possible take in all 3 summits. Starting at a high point of Gortsia 1100m we planned to walk to “Hut C” on the Plateau of The Muses at around 2600m. (There are two huts, Hut B and Hut C fairly close together on the Plateau). We chose Hut C because it is smaller and we thought it might have more character. In hindsight this was a mistake and we’d probably go for Hut B next time! The walk up to the Plateau of the Muses had only a few short steep sections and was not difficult. The final pull onto the Plateau had a short section of chain (10m) though this is avoidable by a short detour which is taken by the mule trains that supply the huts. We started walking just after 9am and were at “Hut C” for 4.15pm. This included a half hour stop at a really nice hut owned by the local Mountain Rescue Team at Petrostrouga 2120m where we had some tea at around noon. If you were arriving into the area for late morning or early afternoon, I would consider walking up to the hut a Petrostruga as an alternative to a hotel or guest house in Litochoro. Above Petrostruga the path continues gently up through more ancient forrest. After about an hour the trees end and a short steep pull brings you to a small summit of Skourta 2476m. 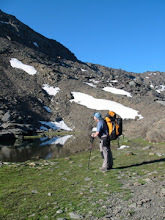 From here you follow an impressive ridge line to the Plateau of The Muses 2600m. Hut C supposedly sleeps 18 people. The night we stayed it was unpleasantly over crowded though in all fairness the Guardian provided great food. The facilities include proper squat toilets. Blankets and pillows are provided but you need to take a sheet sleeping bag. Slippers are also available so you don’t need to carry extra shoes with you. As we arrived at Hut C, the mist rolled in and the stunning views that we had enjoyed all day disappeared. 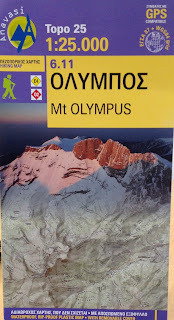 Our plan for the “summit day” was leaving at around 9am to walk the short distance to Mitikas, leave our rucksacks at the bottom of the ascent gully and scramble up to the summit and back. Then re-united with our kit, follow paths around to Skala and Skolio before descending to Hut A. We awoke to find ourselves still shrouded in mist and with persistent rain! The Guardian of Hut C told us that it was too dangerous to climb Mitikas in the wet. (polished limestone is notoriously slippery when wet). So we revised the plan to walk around to Skala and make a decision about Skolio. Leaving the hut at 10am we reached Skala, still in the cloud at noon. We’d had none of what are described as superb views but a great feeling to reach the middle summit of this iconic mountain. On leaving Hut C, we used our map and compass navigation skills to check our progress across the Plateau and to make sure we picked up the correct path. Although most days through the summer this is an easy mountain to navigate, make sure you have the skills, just in case. Otherwise hire a guide!! Back on Skala we were damp and had no views. Although Skolio is only an easy 1Km walk away, we took the decision to descend down to Hut A 2060m. Hut A is big! It’s well equipped, well run and Maria the Guardian is friendly and efficient. But don’t expect a hot shower! A log fire was burning hot in the dining room and we had a glorious evening with plenty of great food and wine. Our trip was at the beginning of September. Chatting to the local guides on the mountain, they confirmed that our choice of route was good but that we should have come in August. August is apparently the month to climb Mt. Olympus! It continued to rain all night and there really was a small river running past the Hut in the morning. However the rain stopped and though we were still in the mist, we set off at 9.15am towards the road head at Prionia 1100m which we reached at noon. The road head at Prionia is really a car park with public toilets and a nice bar / restaurant. The weather was still not inviting enough for the full 5 hour hike along the Enipeas Gorge so we decided to walk down to the old monestary at Agios Dionisios. The people at the bar were really helpful, after a round of coffee they contacted our taxi and arranged for us to be picked up. Fantastic. The old ruined monestary at Agios Dionisios is a pleasant hours walk down the gorge and well worth a visit. It is now being actively re-built from a ruined state, blown up by the Nazi’s during world war 2. So with the Taxi collecting us at 1.30pm, we were back at the bar at the bottom of the Enipeas Gorge for lunch. We shall be running this trip commercially in August 2016. It is unlikely that the weather will be as bad as that described above. Come and join us!